X Il ondule ses hanches en marchant et entraîne les gens dans des danses frénétiques. X Camina moviendo las caderas de forma llamativa. Puede hacer que la gente baile a su ritmo. X Camminando ancheggia in modo seducente. La gente può essere indotta a seguire la sua danza. X 허리를 흔드는 듯이 걷고 있다. 방심하면 엉겁결에 따라서 춤춰버린다고 한다. Y Il communique en utilisant un langage qui semble être humain. Des recherches sont en cours pour déterminer ce qu’il dit. Y Habla emitiendo sonidos que parecen humanos. Se está intentando descifrar lo que dice cuando habla. Y Parla usando un linguaggio simile a quello umano. Sono in corso studi per riuscire a interpretarlo. Y 인간처럼 말을 하지만 아직 무슨 말을 하는지 알 수 없어 현재 연구 중이다. 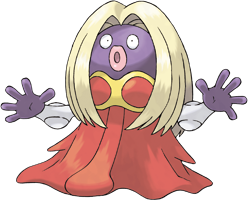 Omega Ruby Jynx walks rhythmically, swaying and shaking its hips as if it were dancing. Its motions are so bouncingly alluring, people seeing it are compelled to shake their hips without giving any thought to what they are doing. Omega Ruby Rossana bewegt sich rhythmisch fort. Es wiegt und schwingt seine Hüften, als würde es tanzen. Seine Bewegungen wirken so anziehend auf Menschen, dass diese beginnen, mit den Hüften zu schwingen, ohne darüber nachzudenken. Omega Ruby Lippoutou marche en rythme, ondule de tout son corps et se déhanche comme s’il dansait. Ses mouvements sont si communicatifs que les gens qui le voient sont soudain pris d’une terrible envie de bouger les hanches, sans réfléchir. Omega Ruby Jynx camina con ritmo, balanceándose y moviendo las caderas como si estuviera bailando. Realiza unos movimientos tan vistosos y atractivos que no hay quien pueda resistirse a mover las caderas. Omega Ruby Jynx avanza oscillando e ancheggiando ritmicamente come in una specie di danza tesa ad ammaliare il nemico. Chi vede questo Pokémon è costretto a iniziare la stessa danza senza pensare a cosa sta facendo. Omega Ruby 춤추는 듯한 자세로 리드미컬하게 걷는다. 그 움직임은 보고 있는 사람마저 얼떨결에 허리를 흔들 정도로 경쾌하다. 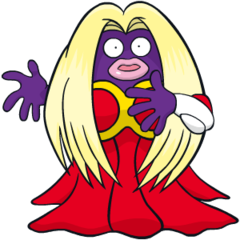 Alpha Sapphire Jynx walks rhythmically, swaying and shaking its hips as if it were dancing. Its motions are so bouncingly alluring, people seeing it are compelled to shake their hips without giving any thought to what they are doing. Alpha Sapphire Rossana bewegt sich rhythmisch fort. Es wiegt und schwingt seine Hüften, als würde es tanzen. Seine Bewegungen wirken so anziehend auf Menschen, dass diese beginnen, mit den Hüften zu schwingen, ohne darüber nachzudenken. Alpha Sapphire Lippoutou marche en rythme, ondule de tout son corps et se déhanche comme s’il dansait. Ses mouvements sont si communicatifs que les gens qui le voient sont soudain pris d’une terrible envie de bouger les hanches, sans réfléchir. Alpha Sapphire Jynx camina con ritmo, balanceándose y moviendo las caderas como si estuviera bailando. Realiza unos movimientos tan vistosos y atractivos que no hay quien pueda resistirse a mover las caderas. Alpha Sapphire Jynx avanza oscillando e ancheggiando ritmicamente come in una specie di danza tesa ad ammaliare il nemico. Chi vede questo Pokémon è costretto a iniziare la stessa danza senza pensare a cosa sta facendo. Alpha Sapphire 춤추는 듯한 자세로 리드미컬하게 걷는다. 그 움직임은 보고 있는 사람마저 얼떨결에 허리를 흔들 정도로 경쾌하다. Red It seductively wiggles its hips as it walks. It can cause people to dance in unison with it. Blue It seductively wiggles its hips as it walks. It can cause people to dance in unison with it. Yellow Appears to move to a rhythm of its own, as if it were dancing. It wiggles its hips as it walks. Stadium Talks in a strange, incomprehensible language. It is known for its weird wiggling that causes people to dance. Gold It rocks its body rhythmically. It appears to alter the rhythm depending on how it is feeling. Silver It speaks in a language similar to that of humans. However, it seems to use dancing to communicate. Stadium2 It rocks its body rhythmically. It appears to alter the rhythm depending on how it is feeling. Ruby Jynx walks rhythmically, swaying and shaking its hips as if it were dancing. Its motions are so bouncingly alluring, people seeing it are compelled to shake their hips without giving any thought to what they are doing. Sapphire JYNX walks rhythmically, swaying and shaking its hips as if it were dancing. Its motions are so bouncingly alluring, people seeing it are compelled to shake their hips without giving any thought to what they are doing. Emerald A JYNX sashays rhythmically as if it were dancing. Its motions are so bouncingly alluring, people seeing it are compelled to shake their hips without noticing. Pearl Its cries sound like human speech. However, it is impossible to tell what it is trying to say. Platinum Its cries sound like human speech. However, it is impossible to tell what it is trying to say. White Its cries sound like human speech. However, it is impossible to tell what it is trying to say. White 2 Its cries sound like human speech. However, it is impossible to tell what it is trying to say.